In the fifth chapter of our “Raw Beauty” series, London-based make-up artist and green beauty maven Khandiz Joni takes a closer look at our bodies. She presents body care as an equally ritualistic and sensual experience. A selection of brands and products, outstanding in their quality and aesthetics, round out her advice. You will all have heard by now that our skin is our largest organ – if you don’t remember that that from junior school biology class. So, why does that matter? In order to understand why it matters, let’s dig a little deeper to begin to decipher some of the key functions of our skin. As an organ, the skin is responsible for a number of important functions. Including, but not limited to, regulating our body temperature, acting as a barrier – both in the sense that it keeps our internal organs inside our bodies and ensures moisture doesn’t escape from our cells, but also keeps many foreign bodies from entering. It aids our body in eliminating toxins through its ability to sweat. The skin carries good bacteria on its surface, which helps our immune systems ward off bad bacteria (which is why it’s vital not to use hand sanitizers that kill ALL bacteria! Washing your hands properly will do the job.) All this these functions happen in the three main layers of the skin. The Epidermis, the Dermis, and the Hypodermis. Not to mention, our skin contains our nerve endings which are required to feel touch. There are still half-truths and downright falsehoods floating around the internet with regards to why we need to switch to clean beauty. I say this because I don’t believe that using scare tactics is a long-term solution for encouraging people to switch to more sustainable (in all senses of the word) options. The story that our bodies absorb 70% everything we put on it is a myth. Our skin absorbs anything from 0% - 100% of what we apply to it topically and therefore we cannot put a definitive figure on how much our skin really lets through, as product penetration will depend on various factors, including, the specific ingredient molecular size, the delivery method and the overall health of your skin. The environment also plays her part. Another common misnomer is that synthetic mineral oil stops the skin from “breathing”. In actuality, plant oils are similar in the sense that they both create an occlusive layer on the skin’s surface because the molecules are too big to penetrate it. The real difference is that our bodies are more in tune with plant oils because they closely resemble sebum; our body’s own natural oil. While there are certainly a lot of questionable synthetic ingredients that do have a negative impact on our health – in truth, the quantities of the ingredients found in our personal care products will not in themselves harm you. It is only when they start bioaccumulating in our bodies that it starts becoming a problem. I think it is important to state that natural ingredients can also cause allergic reactions. The upside of that, is thanks to our “perfect design” we learn very quickly what we are allergic too in nature (if you’re allergic to nuts for instants, our bodies are designed to tell us very quickly), yet we cannot always identify what synthetic chemicals might be causing us discomfort or ill health. We cannot underestimate the importance of touch in our personal wellbeing and development. Imagine if you couldn’t feel a hug? Or feel Egyptian cotton sheets on smooth legs. I mean, what is life without the sense of touch? It’s how Helen Keller survived, after all. If you don’t know who Helen Keller is, she was the first deaf-blind person to gain a BA of the Arts. She went on to become a prolific writer, activist, and lecturer. It was her childhood teacher, Anne Sullivan, that encourage Helen to use her other senses to learn to communicate. You can read more about the pair here. In the book The Nature of Beauty, by Imelda Burke, she advises that switching your body cream out is a key product to upgrade first as it covers the largest surface area. So on that note, lets approach body care as a ritualistic concept based on honoring the senses. I am going to keep this short and sweet. Because let’s face it, we choose our washes firstly, because we like the smell of it and secondly because it serves a purpose. 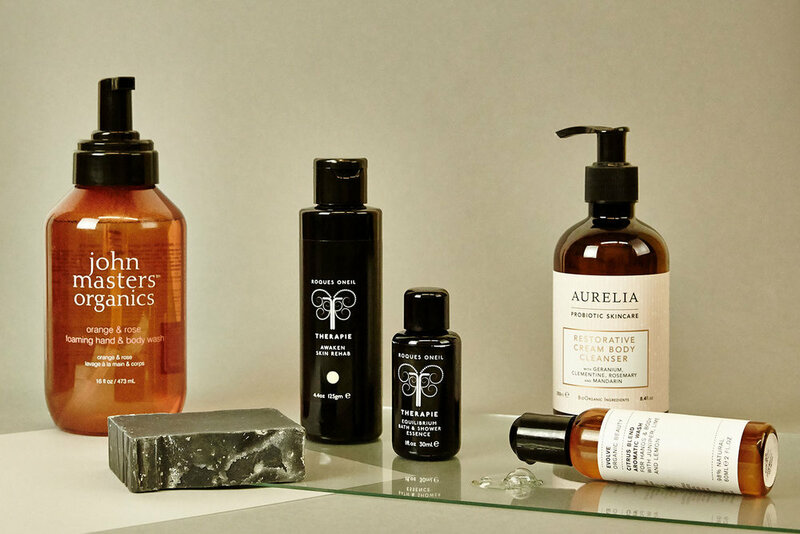 As bathing is a (theoretical) daily exercise, why not make it a ritual but choosing clean products that smell incredible and uplift your mood to get you going for the day or chill you about before bedtime? Choose products whose ingredients don’t actually dry your skin out and strip it of its natural oils. Personally, I’ve been loving the Aurelia Restorative Cream Body Cleanser for its incredible smell and its innovative and luxurious texture. When I need a pick me up, the Evolve Citrus Blend is ideal. Parfum – Synthetic fragrances, as you will know by now are a cause for concern, not because they are necessarily all toxic, but because due to “secrecy” laws, you have no way of finding out what is in the formulation. PEG’s – Silicones that can become contaminated with 1,4-dioxane, which is a known carcinogen. Plastic beads – Sadly some scrubs still contain microbeads made of plastic. Not only is this bad for the environment, the beads can also be very rough on the skin. SLS’s (Sodium Lauryl Sulfate and Sodium Laureth Sulfate) – Gives body washes its foaming property. It also acts as a wetting agent and can be “naturally” derived from the manipulation of coconut oil Sodium Coceth Sulfate). There are no hard and fast rules for how often you need to use a body cream/lotion. Some of us, myself included, are much lazier when it comes to creaming our bodies than we are with taking care of our faces. Others apply lotions and potions daily, almost ritualistically. Listen to your skin. Consider where you live and the time of year. What condition is your skin in? Sometimes your skin will require something a little richer – I love TWELVE Beauty Rewarding Body Balm and Nuori Vital Balm for this. You obviously want to avoid oils if you’re going to be out in the sun, but oils are great to use at night after a bath to “lock in” the moisture. When it’s hot and sticky outside, I tend to reach for a lighter lotion like Dr. Bronner’s Magic Lotion. Mineral Oil – Although not harmful to the body, it is comedogenic (blocks pores) and it is very damaging to the environment. It’s derived from petroleum, which as you might have guessed can actually dry skin out. Propylene glycol - An organic alcohol used as a humectant, wetting agent and product stabilizer. Has been linked to a number of allergic reactions. You might have noticed, that through the series, we have chosen to photograph products in various stages of use… this was done intentionally; to subtly remind us all, that product is there to be used. Buy what suits you, use it until it’s finished. We know how expensive trial and error can be. I always suggest trying out sample products before you commit.